So, it starts with a meal. A nice, romantic meal. It ends with me broadcasting to literally tens of people. Although, to be fair, the magic of the internet means pretty soon my voice will be available to a much bigger audience. In the middle, there is danger, intrigue and a load of other stuff that will compel you to READ ON, dear reader. Phew. Well, after that build-up, here comes the inevitable disappointment of me actually telling the tale. My Significant Other and I headed out on Saturday night to one of our favourite haunts, a local Thai/Mediterranean restaurant. Yes, that is a strange combination. But don’t let it put you off. There are firm historical reasons for this, that I may go into another time. For the purposes of this story, that’s not important. We generally go for the Thai options. For the purposes of this story, that’s not important either, but it adds a little colour, right? We’re enjoying our starters, a good bottle of wine, and each other’s company. And then we smell burning. Now, this isn’t “Chef is ruining my main course”-type burning. For one, they never burn our food. It’s lovely. Secondly, this is an acrid, toxic burning smell. That ain’t no food. And then there’s screaming and shouting. Outside. Oh boy. A couple of us ventured gingerly out of the restaurant. 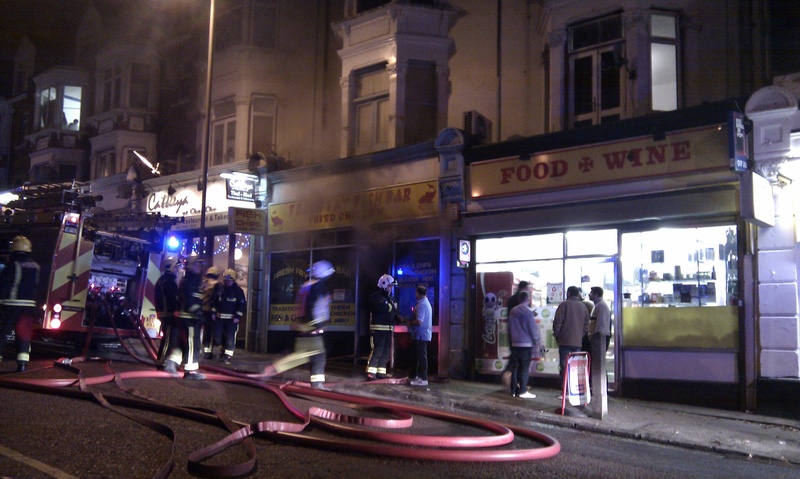 The chip shop next door to us was completely engulfed by thick, black smoke. The shop’s staff were only just stumbling out. It was impossible to even see into the shop through the window. The fire had clearly taken over the building very, very quickly. The staff were clearly upset, and for a moment I had visions that someone was still trapped in there. Thankfully, nobody was. The fire brigade arrived in double-quick time and we left the restaurant and tried our best to keep a fair distance. The staff from our restaurant were great. They let us know that the fire brigade had cordoned off their place too, and that we were welcome to go as they would completely waive the bill. I tried to pay, but they were not having it. I guess we’ll give them a nice big tip next time. As it was clear that everyone was safe, but that the road would be blocked for some time, my Significant Other and I went into Social Media Mode. Damn us and our fancy phones. We tweeted the situation, put photos up and through retweets got word out locally to avoid the area. We felt like Very Modern Citizens. Or something. The next day I wrote a piece for a local site, the Charlton Champion. And yesterday, a friend of mine who is starting out on hospital radio asked me in to speak about the fire. Broadcasting history, people! It was great fun to sit in an actual, proper studio and chat away for a while. I also talked about my amateur acting stuff. This is another story, for another time. I hope the inmates patients enjoyed my dulcet tones. A podcast of the show should be up shortly for the wider world to delight in. You should listen in. Not to my bit though. I have an awful voice. And you know the story already. An action-packed few days. I’d have liked that Thai Red Curry, though. We’re not worthy. Not only are you now a fully fledged celeb but you’re also a positive activist (via social media) in the mode of Bono. Well if not Bono then at least in the mode of John Prescott when he dived into cold, cold waters to rescue someone. 😀 Remember, fame may last shorter or longer than fifteen minutes. No refunds. And it might be worth insuring yourself against being pestered by Jordan now that you’re in the news. Oh and I forgot to say, in social media style. OMG! Oh dear, if I’ve turned into some sort of unholy mix of Bono and John Prescott I really ought to retire from the public eye! Tweeters win again. First it’s where I found out that Leslie Nielsen died; now this. Glad nobody was hurt. I guess Leslie Nielsen died, but that’s not the fire’s fault. Or Twitter’s, for that matter. Whenever I see a celebrity’s name ‘trending’ on Twitter, I wonder if they’ve died. It’s an odd feeling. Yeah, I have the same problem with the whole trending thing. Kind of freaks me out. I also like getting my obituaries from the New York Times, so Twitter’s pretty much just a big spoiler. I’m glad you, your SO and everyone else at the restaurant are OK. Thanks Julie! It was only afterwards that we realised how lucky everybody was.